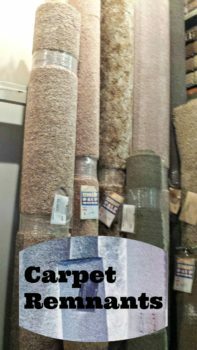 Have you even heard of carpet remnants? When we went to purchase our carpet, another customer asked to go back and look the remnants. The salesperson took them to the “secret” location in the backroom. Some place you wouldn’t see unless you knew about it because it was behind the customer showroom. A place where it only appears employees go. We wanted to go where no other customer had gone before, well at least where most other customers have never been before. They sell the scraps of carpet after it’s been installed. And we are talking some large scraps. 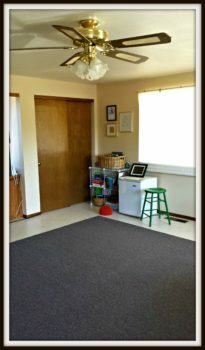 We wanted a large throw rug for the family game room but didn’t want to pay big bucks. We saw the perfect type of carpet there. The salesperson told us we could buy it and they will cut to the size we need. She also shared that they will bind it for a fee. We decided against the binding and just had them cut it to a 12×12. When we have priced similar sizes they run about $200. We got ours for just under $90. That is more than 1/2 price!!! There were many types and styles to choose from. The next time you need a rug, check out your local carpet store. The room isn’t done yet, but we are one step closer. Did you know about remnants for sale? Are you one that has gone where no other customer has gone before? Great idea. Why did you decide not to have it bound? Do you have yarns coming off? Hi Vicki, Thanks for stopping by. We didn’t bind it for cost reasons. We haven’t has any issues but we may use clear caulking to ensure it stays put. So far so good.